The following is a look at the calendar with Iowa, New Hampshire, Nevada and South Carolina placed where the national parties have specified and when contests in the remaining primary states are scheduled according to state law. 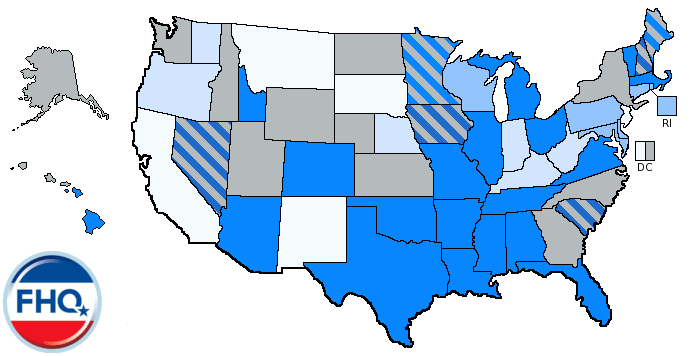 For a glimpse at what the 2012 presidential primary calendar looks like currently, click here. No, nothing is official and nothing will be regarding the 2012 presidential nomination rules until August. However, let's assume for a moment that the rules as currently proposed in both parties will be adopted. That means that Iowa, New Hampshire, Nevada and South Carolina can hold contests in February while the remaining states and territories have to carve out a space between the first Tuesday in March and the first Tuesday in June. The scuttlebutt from New Hampshire -- at least following the Republican Temporary Delegate Selection Committee recommendations -- has been that, under that scenario, Iowa would hold its caucuses on the first Monday in February followed by the New Hampshire primary eight days later. Nevada and South Carolina would hold their events at least a week later. Then, once March 7 hits, all the remaining states would be free to schedule their delegate selection events. Yes FHQ, but how would the calendar look? I'm glad you asked. No, I doubt Iowa, New Hampshire, Nevada and South Carolina volunteer to take those spots, too. None of those states will jump first and wait on the remaining early states to move back to comply with the national parties' proposed rules. Iowa won't volunteer to go after Florida and New Hampshire won't willingly hold its primary after Super Tuesday. Iowa and New Hampshire are never the first to move anyway. They reserve the right to move last -- after every other state has locked into position. FHQ doesn't want to risk beating a dead horse here, but this is just another way of showing how difficult it is going to be for the parties to get those February states in line. The "yes, but look what happens if we stay put" argument comes out in full force if there isn't an adequate enforcement mechanism in place. I think Florida would quite like this set up, don't you? Of course, Iowa and New Hampshire would shift the dates of their contests to something like this* if that happened. The 2012 Frontloading Problem: What's Our Incentive? Yesterday I spoke with someone from Gannett about both parties' current attempts to devise rules systems governing the 2012 presidential nomination process. We discussed a lot in our five minute conversation, but the thing that struck me was his question on the likelihood of more rogue states in 2012. FHQ's standard answer is that as long as both parties are on the same page on the issue of timing, then most states will fall in line. However, I think that there is some need for a caveat. The big what if in the back of the minds of those within the national parties is whether states will actually go along with that. What if they don't? 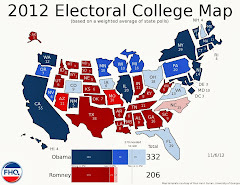 What's is the incentive for those 19 pre-March states to move back to comply with the likely rules for 2012? In most cases, in the opinion of this site, states will just comply. It just won't be an issue. Yet, for other states there may be no incentive to move back. Additionally, that latter group of states may not flinch at the enforcement mechanism put in place by either or both parties. And therein lies the question that came out at the Democratic Rules and Bylaws Committee meeting last week: What is that enforcement mechanism? I don't know about the Republican Party, but I got the sense that no one in the room last week knew what that was or more importantly what it should be. As I said, I don't think it will be a problem in a majority of the 19 cases. * Most states will fall in line and the system will revert to its earlier nothing-before-the-first-Tuesday-in-March form. There are, in FHQ's estimation, a small handful of states that could dare the national parties to do something -- anything -- to sanction them by sticking to their 2008 calendar positions. And I don't think the parties would have much recourse but to let them. Yes, but where is that line of demarcation? Which states would be better able to call the national parties' bluff if they really wanted to? 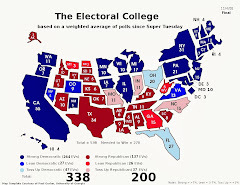 Allow us to enlist the help of our Electoral College Spectrum [This version of the spectrum is based on the final results in the 2008 election.]. The idea of the spectrum is simple: It rank orders the states from the most lopsided Democratic state (Hawaii in the top left corner) to the most lopsided Republican state (Wyoming in the bottom right corner). The two extreme columns aren't that helpful to us. Those are the most reliably Democratic and Republican states. But as we move inward the states get more competitive. And the more competitive a state gets, the more leverage it would have on the national parties in terms of primary timing. Let me parse this out. Given that information and the 2008 experience (Think Indiana and North Carolina from the primaries to the general election for the Democrats. ), what would you do? Personally, I'd balk at the parties. If you are a state that is already scheduled early (earlier than the proposed party-designated March starting point), why not roll the dice? The parties would be stuck. 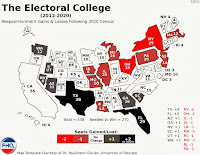 Why would they pass up a golden opportunity for some early grassroots party-building for the general election in a state that will ultimately prove consequential to either side's electoral college calculus? They wouldn't; not in the way the Democrats did with Florida and Michigan in 2008. If all either party is doing is stripping a rogue state of half their delegates, then it could be open season for movement, as it isn't likely to deter states from either staying early or moving to earlier dates. But if they are trying to keep the candidates out of the state -- like the Democrats did in 2008 -- then the move is potentially counterproductive down the road in the general election. The parties could come down hard on states that would go their way in November regardless. They could keep those states in line with little or no threat of it coming back to haunt the party and their candidate in November. I could also foresee the national parties being able to strong arm state parties making the decisions on caucuses to comply (That extra filter of the state government doesn't exist in those states.). But in competitive general election states? The parties would have to be blinded by the need to sanction rule-breakers in the short term to hamstring themselves long term in the general election in an electorally consequential state. So, if you're Florida or Virginia or Arizona or Missouri or Michigan and you are already scheduled in the pre-window period, why not hold your spot and see what the parties will do to you? [Of course, I don't see the Republicans attempting that kind of sanction. Then again, I didn't see the Temporary Delegate Selection Committee proposing to require early states to allocate delegates proportionally versus having the freedom to determine the mode of allocation either.] In a nutshell, there isn't a whole lot the national parties could (or would) do in that case. It would hurt them in the general election. * I should note that there is a sequence to all of this. If one of these states telegraphs that it is going to stay in place, thus violating the proposed rules the two parties have out there at the moment, it could open up the floodgates. A handful of states with some leverage could become a full scale 19 -- or more -- state problem. As FHQ alluded to on Friday, we sat in on the festivities at the Democratic Party's Rules and Bylaws Committee meeting on both Friday and Saturday. The intent of the meeting was to begin reconciling the recommendations of the Democratic Change Commission with the political and structural realities on the ground with regard to the rules governing the 2012 Democratic presidential nomination. As some have already said, this was a jump off the deep end into the minutiae of delegate selection rules. However, the committee members revved up for the discussions surrounding the three areas the Change Commission was tasked with re-examining: primary and caucus timing, superdelegate reduction/elimination and caucus rule uniformity. The most animated portions of the proceedings came at the tail end of Friday's session and at the beginning of Saturday's. Of the 21 rules -- based on the 2008 delegate selection rules -- Rules 9 (superdelegates) and 11 (timing) seemed to elicit the most concern; the departure from the '08 rules the Change Commission's recommendations represented did, at least. The decisions on both rules were tabled at this meeting pending further discussion at the July 9 and 10 meeting in Washington that will finalize a set of rules for the full DNC to vote on in August. Well, if the Change Commission's recommendation is approved, they won't be superdelegates anymore. They'll be NPLEOs (National Pledged Party Leader and Elected Official). That's right. The recommendation calls for the elimination of add-on delegates and a change to the superdelegates as we knew them in 2008. Under these rules, the party and elected officials would lose their independence in 2012. They would be proportionally pledged to candidates based on the results in the primaries or caucuses in their states. As you might imagine, this didn't sit particularly well with a group of folks (the RBC) who happen to be superdelegates. No one seemed to like the loss of independence (read: influence). That loss prompted RBC member, Mame Reiley, to ask if leaders shouldn't be able to lead instead of follow. She cited Ted Kennedy's endorsement of Obama ahead of the Massachusetts primary (and Hillary Clinton's win there) as an example. In other words, how could you tell an elite within the party to support someone they don't want to support (with the only alternative being to become a non-voting delegate)? To FHQ's mind this isn't any different from the average delegate moving over to the actual nominee at the convention despite that earlier pledge. It happens routinely. Still, the members of the RBC took issue with the proportionality calculus and how that would play out in reality. Some made the argument that it was the job of the RBC to plan for the worst case scenario, a floor fight over the nomination. But while that may be true, it isn't likely to be the reality in 2012. As RBC member, Ray Buckley said, "I'm ambivalent about this...because I don't think the president will be challenged in 2012." There were some alternate proposals bandied about. The one that seemed to resonate was one that had alternate delegates becoming actual delegates as a means of diluting the influence of the superdelegates. This seemed like a clever enough idea, but obviously needs to be fleshed out some. That represents quite an expansion of the number of delegates which has implications for floor seating because there would still have to be alternates who also get a spot on the floor even if they are not voting. I don't see that proposal making it nor do I necessarily see the Change Commission's proposal getting through the full DNC. One thing we can likely count on is the elimination of the add-on delegates. Beyond that, there may not be a whole lot of movement on the superdelegates issue. With Obama running unchallenged in 2012 (more than likely), that group will return to its spot in the background of the process. This issue was why FHQ went to Washington for this meeting in the first place. Presidential primary and caucus scheduling (or movement from cycle to cycle) is our bread and butter. And while Tom Schaller is right that not much substance came out of this meeting, the group will have a large discussion in July that will have found its roots in the groundwork laid on Friday and Saturday. First, the Change Commission has called for Iowa, New Hampshire, Nevada and South Carolina to retain their privileged positions in the pre-window period of the primary calendar from 2008. The Democrats got a major assist on making that recommendation a reality from the Republican Temporary Delegate Selection Committee last week. The TDSC followed the Change Commission's lead in not only keeping those four states early but in knocking back the start date of the process from January to February and preventing all other states from going before a the first Tuesday in March (A return to -- at least for the Democrats -- something akin to the 2000 primary calendar.). That's a big deal and it certainly helps both parties on the enforcement front somewhat. If both parties have the same timing rules, it makes it far less likely that a Republican-controlled state government, for example, will opt to flaunt Democratic Party rules to maintain or move to an earlier, pre-window date on the calendar (This assumes a scenario where the Democrats adopt the Change Commission recommendations on timing, but the Republicans are more open to allowing earlier contests.). Enforcement of the delegate selection rules is more difficult when the parties aren't on the same page. However, just because it appears that the parties will, I won't call it coordinate, but correspond with each other on timing, doesn't necessarily mean there won't be any rogue states like Florida and Michigan in 2012. Enforcement of the timing strictures was one of the sticking points with members of the RBC during this discussion. In the end, it really wasn't dealt with, but pushed to the July meeting instead. There are enticements (bonus delegates) for going later, but will that get the 19 states currently scheduled (according to state law) in February to move their primaries in accordance with the possible rules changes? That is the question at this point. Nothing has worked thus far on that front as a means of curbing frontloading, but both parties will have to hope that all works out for the best when and if both produce similar calendars for 2012. One final thing that received quite a lot of discussion was the idea of opening the pre-window period to a bidding process for those four slots. A similar proposal system was used by the Levin Commission in 2006 before it added Nevada and South Carolina to the Democratic pre-window period for 2008. But RBC member, Michael Steed, proposed opening all four slots (including Iowa's and New Hampshire's) up for 2012. This received some support in the room, but was shot down by RBC member, Jeff Berman, shot that down, saying it was too late in the process for that (especially if a set of rules was going to be in place for the full DNC to consider and vote on in August). The proposal process was already well underway at this point in the cycle before 2008. Another talking point concerned just adding an additional slot or two in the pre-window period. This, too, was denied, but an amendment was added to the rule that this be considered for 2016. That was passed while the rest of the timing issue was tabled for the July meeting. At this point, the calendar will is very likely to be adopted by the full DNC, but the questions of clustering and enforcement still remain in shadowy territory. There are no clear answers for either. The theme of this meeting was the balance between crafting a set of delegate selection rules that rectifies some of the issues raised by the Democrats' 2008 primary race and reelecting the president. To some members of the RBC those two were countervailing forces. The "if it ain't broke, don't fix it" argument that RBC member Alice Germond made is a tough one to counter. Indeed. Why mess with a formula that worked? Upon further reflection, FHQ is not terribly sympathetic to that line of thought. Now, we don't have a dog in this fight. Reform or not, this site will have an eye to the 2012 rules regardless. However, this argument seems like a veiled attempt to maintain the status quo. After all, how much of the election results in November 2008 were attributable to what happened in the winter and early spring? A Democrat would have won in November regardless, whether it was Barack Obama, Hillary Clinton or John Edwards. [Well, Edwards would have been in some hot water in August 2008 with the Rielle Hunter ordeal if he was the presumptive nominee at that point.] At the margins, the competitive races in Indiana and North Carolina may have helped lay the groundwork for Obama and the Democrats successfully turning those long-standing red states blue. But those 26 electoral votes would not have been decisive. They were luxuries that a severely toxic 2008 Republican brand afforded the Obama campaign and the Democrats trying to elect the president. Now, some of the points outlined above regarding the status quo may be moot. It may not matter and here's why: The head of the Democratic Party may want to make the Democratic Change Commission's recommendations a reality. Changes to the rules are not likely to affect the president's chances at renomination. The likelihood of him being challenged for the Democratic Party nod is as close to nil as it gets at the moment. So, why not push these recommendations through? The DNC probably won't balk at the president if this is what he wants. But is that what the president wants? That's the $64 question; the one that is likely to determine the extent to which the Rules and Bylaws Committee goes along with the Change Commission's recommendations. But we'll have to wait until the July meeting for that answer. FHQ is on site at the Democratic Rules and Bylaws Committee meeting to discuss the Democratic Change Commission's 2012 presidential nomination rules recommendations. I'll have some longer updates later, but for now, you can follow in real-time with updates via Twitter.